There is no dish that says ‘family dinner’ better than a lasagne. It is the ultimate in family sharing and everyone loves it. I had to make one because, not only do I love it, but believe it or not I have never made a proper classic lasagne. I’ve made a mushroom lasagne and various alternative versions but never have I made a proper classic, back to basics lasagne. 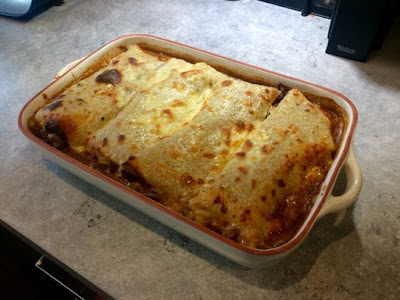 Inspired by the current Sainsbury’s ad campaign that encourages you to make a twist to your usual family favourites, I did just that with this lasagne. In the advert, they throw some chorizo into the meat sauce to spice things up a bit. 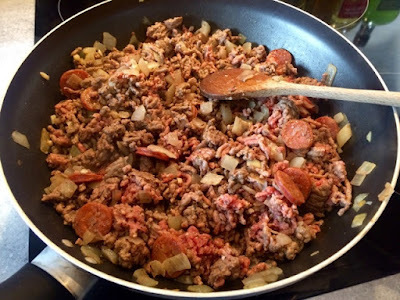 Since I’m a massive fan of chorizo and throwing some into a chilli or a bolognese is something I do all the time anyway, I find it adds a great richness and more depth of flavour, I decided to give it a go. Other than that, everything’s pretty traditional. If I didn’t live with two people who believe mushrooms are the spawn of the devil, I would have thrown them in but this was such a tasty dinner I didn’t really miss them. Despite the fact there are only three of us in the house, I used my biggest dish. Firstly because I find it easier to make in a large batch, and secondly because it’s the best meal for reheating for packed lunches and easy weeknight dinners. It lasts well and tastes just as good second time around, if not slightly better. 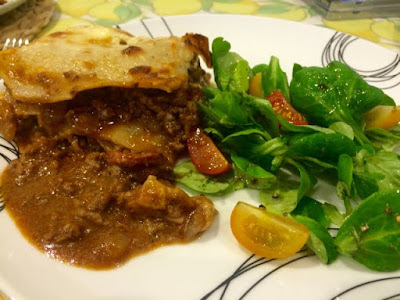 Lasagne, cottage pie and moussaka are my favourite dinners to make in a big batch to reheat later in the week. As it’s quite a rich dish I usually just serve it with a simple leafy salad. 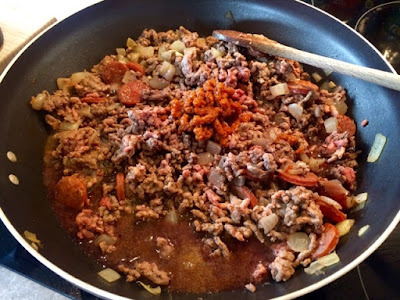 I’m entering this into Corina’s Cook Once Eat Twice November link up, so pop on over to Searching for Spice to find other recipes that you can prepare ahead or will last you a few days like this one. 2. In a large pan, gently sautéed the onion and garlic. 3. 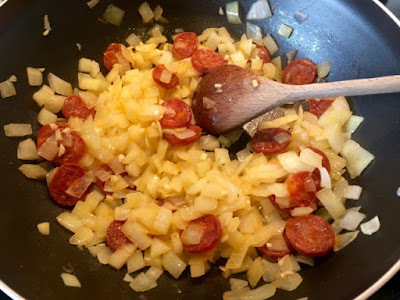 When the onions are softened add the chorizo and cook for a further few minutes allowing the oils to seep into the onions. 4. 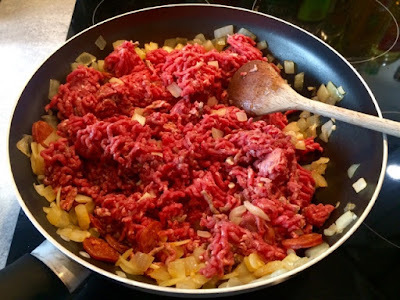 Add the beef mince, mixing through and stirring regularly until browned. 5. Add the dried herbs and mix through. 6. Add the wine and turn up the heat for a minute or two to cook off the alcohol. Add the tomato purée and stock pot/cube and stir through. Cook for a further couple of minutes. 7. Add the passata and a few splashes of Worcestershire sauce. Mix everything up and bring to the boil. 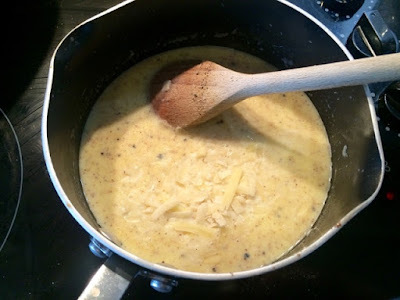 Reduce the heat and allow to simmer for 15-20 minutes while you make the white sauce. Do not allow it to dry out to much, add some water if the liquid is disappearing. 8. 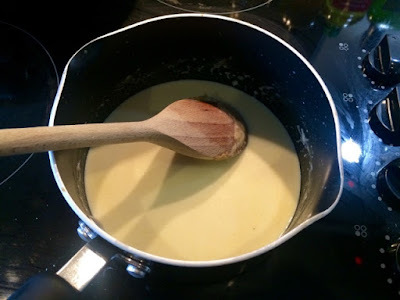 In a separate saucepan on a low heat, melt the butter and add the flour, mix together until they form a paste. Add the milk a splash at a time, combining completely each time before adding more milk. Adding it a little at a time rather than all at once will prevent the sauce from going lumpy. 9. Continue to stir while the sauce thickens. 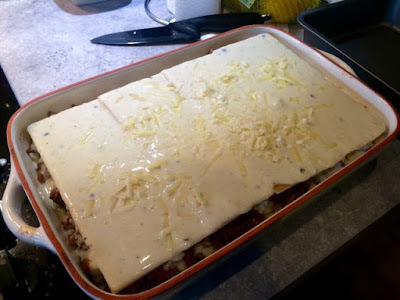 Add most of the grated cheese (reserve a little for the top of the lasagne). Stir in until melted. Add the nutmeg, salt and pepper and season to taste. 10. 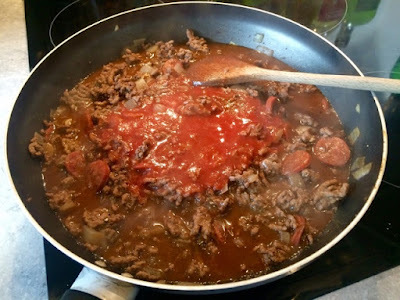 Pour a layer of meat sauce into the bottom of your dish, cover with a layer of lasagne sheets and then pour over white sauce to cover. Repeat this process until the meat is used up. I usually get two layers out of it. 11. 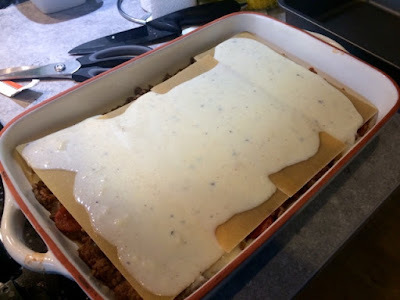 Sprinkle the remaining cheese over the top of the lasagne and cook in the oven for 20-30 minutes or until the top is golden and bubbling. 12. Leave to cool for 10-15 minutes before serving. 13. Serve with a leafy salad dressed with extra virgin olive oil and balsamic vinegar. It looks gorgeous! I'm a real fan of lasagna but it's years since I've made one. 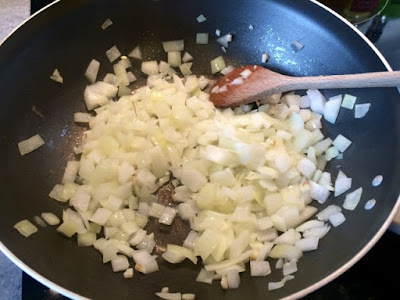 Thank you for linking up to Cook Once Eat Twice.